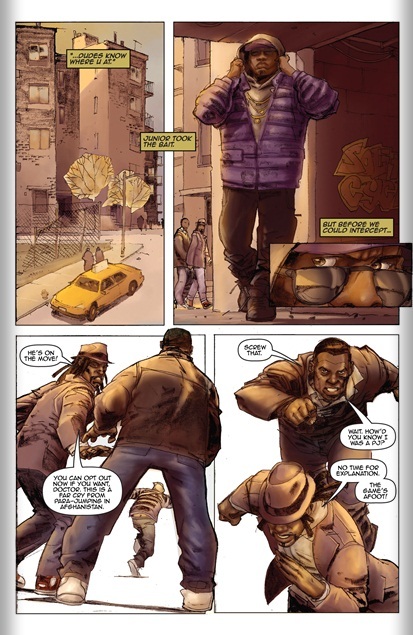 WATSON & HOLMES–Re-envisioning Sir Arthur Conan Doyle’s Sherlock Holmes and Dr John Watson as African Americans living in New York City’s famous Harlem district. Watson, an Afghanistan war vet, works in an inner-city clinic; Holmes is a local P.I. who takes unusual cases. When one of them ends up in Watson’s emergency room, the unlikely duo strike up a partnership to find a missing girl. 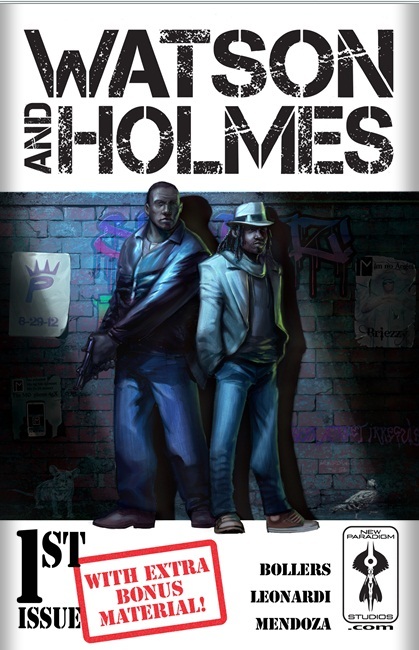 Watson & Holmes bump heads along the way as they enter a labyrinth of drugs, guns, gangs and a conspiracy that goes higher and deeper than they could have imagined…. Cover– Very distinctive is the best word to describe this cover from new paradigm studious. Watson and Holmes are smack dab in the center, the logo splashed across the top while the studio logo, issue number etc are at the bottom. The color and style make this one of my favorite covers of the year. Characterization- The best thing about this book is how distinctive both our lead characters personalities are. Jon Watson is the larger of the two with a background in medicine. Holmes meanwhile is a bit of an eccentric though clearly a brilliant detective. There are other touches here and there but if you’re interested you should buy this book. Art– While not the most detailed there is a certain distinctiveness that makes it worth your attention. The art and soft colors give the book a painted effect, not as dynamic as Dusu but visually pleasing and suitable to the tale. Action– Not much action in this opening issue but the chase was well illustrated and as a result of the great characterization I was truly drawn into this stylized and distinct take on Watson and Holmes. 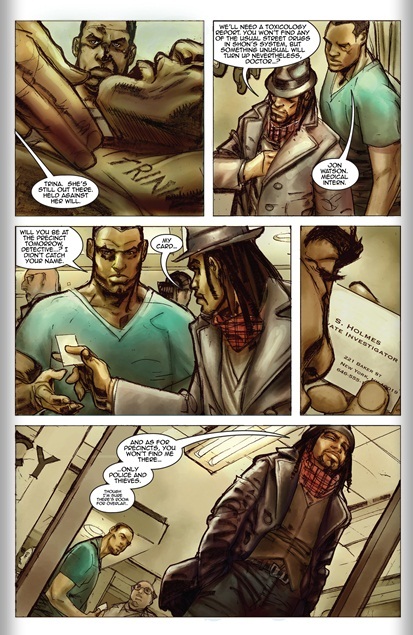 Black Heroes– Introducing the black Watson and Holmes courtesy of Bollers, Leonardi and Mendoza, by the sound of the buzz on the net they are a runaway hit! Re-imagining– Like Batwing, Miles Morales/Spider-Man, Steel or Icon before it this book gives credence to taking established characters and looking at them through the myopic lens of another race. You would be shocked sometimes what gems you could find. Art– The interior art viewed in isolation won’t win this book any awards or new fans. Black versions of White Characters– Some fans roll their eyes and complain the moment they realize that a black character or characters have been created from an original white template. Miles Morales/Spider-Man,, Icon, John Stewart/Green Lantern, Firestom, Steel, J.J Thunder, Aqualad etc. All these characters add a certain distinction between themselves and their white counterparts, some may complain that a new coat of paint does little to enhance a story but like those mentioned Watson and Holmes by looking at a classic from a difference racial and time period perspective we may be witnessing pure gold in sheer creativity.